Premier Gymnastics of the Rockies Optional team traveled to St. Paul, Minnesota February 28 through March 2, 2014 to compete in the Northern Lights Gymnastics Meet. The Level 7 team placed 4th in the team competition. The Level 8 team placed 3rd in the team competition. There were several top 5 individual placements. In the Level 7, 11 and under Division, Kira Sanchez placed 5th in the All-Around. Katie Parsons placed 2nd on Vault and 4th on Uneven Bars. Madison Blair placed 1st on Vault and tied for 3rd on Floor. In the Level 7, 13 and over Division, Kaiya Lindhardt placed 3rd on Vault and Uneven Bars, 2nd on Floor, and 4th in the All-Around Competition. Zoe Beard placed 2nd on Vault. In the Level 8, 13 and under Division, Sidney Strizki placed 2nd on Uneven Bars. Kairey Vela placed 3rd on Balance Beam. Tatum Graham placed 3rd on Floor. In the Level 8, 14 and over Division, Morgan Adams placed 3rd on Vault and 5th on Uneven Bars and Balance Beam. She tied for 4th on Floor and placed 4th in the All-Around Competition. 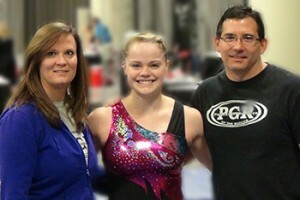 Kaitlyn Holley competed in the Level 10 Senior Division. She placed 3rd on Floor during the meet. There were 83 Level 10 competitors. The top 8 Juniors and top 8 Seniors in each event qualify for Event Finals. Holley was invited to compete in the Event Finals for Vault and she qualified for Event Finals on Floor. She placed 7th on Vault and 4th on Floor in Event Finals. Strizki, Vela, Graham, and Adams all qualified for the Level 8 Colorado State Meet. They will compete at the State Meet in Aurora, CO on March 15, 2014. The Level 10 State Meet is March 21-22th, 2014. Holley is a State Qualifier and will be competing at Level 10. The Level 7 State Meet is March 29-30, 2014. The Level 7 qualifiers are Sanchez, Parsons, Blair, Adams, Lindhardt, Beard, Kylla Justice and Nicole Sims. Photos by Twistars Photography. 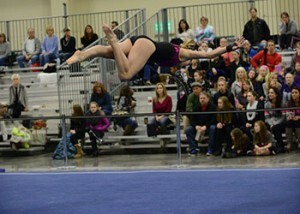 Photo 1 is Kaitlyn Holley performing her floor routine. Photo 2 is Coach Shannon Renke, gymnast Kaitlyn Holley, Coach Rich Villareal. Next Story: My pet is having trouble breathing – What do I do?